ELEVATED TRIGLYCERIDES | Standard Treatment (Meds) Options - Full of Health Inc.
Failure to treat patients with elevated blood triglycerides, thereby increasing their risk of a cardiovascular event or of pancreatitis, is a potential medical pitfall. Elevated blood triglycerides, as a part of lipid management, have become a major medical problem. This website is intended to allow you to become an informed patient who can manage your own care, ask the right questions, insist on adequate management and information, and seek an optimal outcome for yourself. Perhaps it will even help the health professionals who are giving care to better understand and, hopefully, incorporate into their practice the nutritional approach to high blood triglycerides. Please note that this website is not intended for “most people”. It is written for those who want to stand out in self-health care. If you are such a person, we strongly advise that you give serious thought to all of the suggestions about how to improve you blood lipid profile, triglycerides in particular. If you are tempted to think the suggestions are too complicated or too simplistic, or even biased, we assure you they are not. In May, 2001, the U.S. National Cholesterol Education Program (NCEP), a division of the National Institutes of Health (NIH), released recommendations on who should be treated for elevated triglyceride levels. The NCEP recommendations ("consensus statements") are the products of independent, non-Federal panels of experts and are based on the panels' assessments of medical knowledge available at the time the statements were made. Therefore, they provide "snapshots in time" of the state of knowledge of the topics (new knowledge, however, is inevitably accumulating through medical research). It should be noted, however, that the usually quoted "normal" blood lipid levels do change as they depend upon the levels found in the majority of the population as well as upon what... health officials decide is normal. Therefore, the declared "normal" triglyceride levels -- that your doctor will use to tell you whether your various serum/blood levels are "normal" -- do NOT necessarily mean "healthy" levels. Keep in mind, these are only guidelines. The ranges were developed based on the entire population and may not apply to individuals. PLEASE NOTE: Fasting values should be based on two serial measurements of serum (blood) triglycerides. Serial measurements are important because of intraindividual triglyceride variability which is 5 times that of cholesterol. Not surprisingly, the 2001 expert panel's guidelines may ultimately increase the number of patients on statin drugs to as many as 50 million users. (Cholesterol Guidelines A Gift For Merck, Pfizer. 07.12.04, 4:30 PM ET Forbes Magazine). However, in an embarrassing oversight, the same government panel drafting the guidelines failed to mention that several of the panelists are linked to some of the pharmaceutical companies that manufacture statin drugs. A study recently published in the JAMA states that fewer than 10 percent of all patient decisions are well informed. To date, there has been still a limited number of prescription drugs that treat patients with high triglyceride levels; medications are usually prescribed - if, after sincere efforts of diet and exercise have been tried, triglycerides are still elevated. Unfortunately, for many people lifestyle changes have not been sincere enough, and a lipid-lowering drug treatment is being prescribed. From conventional doctors' point of view, being on medication doesn’t mean you failed – just that you need a little more help that diet and exercise can provide. And your doctor will tell you there is nothing to worry about side effects which are minor and in any event more acceptable than high triglycerides levels. However, the fact is prescription drugs do have serious potential side effects and there are far safer ways to treat abnormal blood lipid levels and decrease cardiac deaths without taking medications. Despite this, you would be astounded how many people would rather take a pill with multiple health risks than consider changing anything else. Triglycerides are lowered modestly and only a small increase in HDL-”good” cholesterol can occur with statins. HMG-CoA (3-hydroxy-3-methylglutaryl coenzyme A) reductase inhibitors, commonly known as statins, are a class of cholesterol-lowering drugs used in the standard medical treatment of elevated blood fats (hyperlipidemia). in the UK - Zocor, Lipostat, Lescol, Lipitor, and Crestor. Statin therapy can achieve reductions in LDL-“bad” cholesterol of approximately 30-40 percent. However, reductions in excess of 50 percent are achievable only with high doses of some statins. Statins work by blocking a key liver enzyme involved in this process, thereby slowing down the production of cholesterol in the liver. This encourages the liver to take extra cholesterol, LDL-“bad” cholesterol in particular, out of the bloodstream, causing the LDL cholesterol level to decrease. As cholesterol synthesis tends to be highest at night patients are generally advised to take their statin dose at night, with the exception of Lipitor, which can be taken at any time. Statins are now recommended for all patients with established coronary disease. LDL-“bad” cholesterol level above 3 mmol/L, or 116 mg/dL. PLEASE NOTE: Combination therapy of statins and fibrates should not be ruled out for all patients (Feher et al 1994). Certain high-risk individuals with dyslipidemia, for instance those with familial hypercholesterolaemia, diabetes, or coronary heart disease (CHD), may need to have combination therapy. Grapefruit juice should be off the menu for people taking statins. Not enough people know or take notice of the grapefruit/statin issue. The leaflets accompanying the tablets (but how many people take notice of these?) often state that you need to be wary of this citrus fruit. If you are taking statins, particularly simvastatin (Zocor) and atorvastatin (Lipitor), you should avoid grapefruit juice; other fresh fruits, including limes and lemons, seem fine. potentially lethal effects on the heart muscle. If you take statins of any sort, but particularly these two (Zocor and Lipitor), steer well clear of grapefruit juice. Some doctors think a little is OK occasionally, but we’d err on the side of caution and give it a wide berth. Also alcohol potentiates the toxicity of cholesterol-lowering medications much more than the drugs would do alone. Actually, this is the major problem with the statins. By drinking alcohol daily, you may increase your chances of serious statin side effects, especially liver problems. Therefore, to protect your liver, you should go easy on alcohol or avoid it completely while taking a statin drug. I am a 39-year-old male that works out daily, eats well and has always been healthy. I was prescribed Lipitor to bring down my tri-glycerides and everything went to hell in a hand basket. I had a bout of a-fib, which scared me to death and then I was diagnosed with non-lethal arrhythmia. The sensation is like being on an elevator that drops suddenly. The heart seems to skip beats and you get a heart falling, hollow, empty sensation. FDA News: Counterfeit "Lipitor" Sold in the U. K.
On July 29, 2005, the Food and Drug Administration (FDA) alerted U.S. residents to the recent recall of a batch of counterfeit "Lipitor" (atorvastatin) sold in the United Kingdom (U.K.). The counterfeit Lipitor 20mg tablets were recalled in the U.K. on July 28, 2005. Health authorities in the U.K. stated that initial results of tests performed on the counterfeit drugs do not indicate that this product poses an immediate risk to patients, however, they are advising that patients stop taking the drug and return it to the pharmacy where they obtained it. U.K. pharmacies are being advised to return all remaining stock of this batch to Pfizer Ltd., the manufacturer of Lipitor. Consumers who purchased FDA-approved Lipitor products through legitimate U.S. pharmacies should not have received any of these counterfeit tablets and are not subject to this recall. But some U.S. residents may have obtained prescription drugs from the U.K. through the operations that do not supply legitimate, FDA-approved products, or through state-run drug importation programs that facilitate the purchase of unapproved foreign drugs. Consumers who purchase drugs through these arrangements may have received these counterfeit products. The affected product is 20 mg. "Lipitor" and is sold in packages of 28 tablets. The drug packages are marked with batch number 004405K1 and an expiration date of "11 2007." The batch number can be found on the end of the box next to the expiration date and on the foil backing of the drug's blister pack. Legitimate U.K. Lipitor also has this same batch number. Because the recalled Lipitor is fake, there is no guarantee of its quality or effectiveness. U.S. patients who have the identified U.K. drugs should stop using them and should consult their physician or pharmacist if they have any questions or concerns. This well-known and one of the world’s best selling cholesterol-lowering prescription drugs was cleared by the U.S. Food and Drug Administration (FDA) in 1997 to lower triglyceride levels in patients with combined or mixed dyslipidemia (both high cholesterol and high triglycerides). Zocor (Simvastatin) is indicated in addition to diet - after diet alone has failed to achieve target levels. women who are pregnant, breast-feeding, or of childbearing age who could become pregnant. PLEASE NOTE: In order to view PDF documents, you must have the Adobe Acrobat Reader installed on your computer. My name is Janet H., married and will be 49 in April. I had a wonderful life but it has seen to ended with Zocor. Zocor has become a nightmare for me. I started Zocor in September or October 2002 and been sick ever since. My muscles ache all the time and my arms go to sleep at night, also have calf cramps. I had really bad itching (...) In addition I have all the following: headaches, hot & cold flashes, dizziness, blurred vision and memory problems. My left arm is very weak. I have extreme fatigue. When I had told my doctor all of this, he did a blood test and told me that it wasn’t related to Zocor and I know it is. In 2000, a new indication for Lescol (Fluvastatin Sodium) - a prescription cholesterol-lowering drug - was approved to additionally decrease triglycerides in patients with combined or mixed dyslipidemia raised cholesterol levels are associated with raised levels of triglycerides). Mixed dyslipidemia - both elevated cholesterol and triglycerides - is a condition which affects approximately 40 percent of patients in the U.S.
coronary heart disease (CHD) - to slow the progression of atherosclerosis. Treatment with Lescol XL should be discontinued if myopathy and rhabdomyolysis are diagnosed or suspected. I have started taking Lescol and my knee has experienced great pain. I was rehabed and running for almost 5 years. After two months of taking Lescol, my knee has degenerated to the point I cannot run, I am in almost constant pain. I did not injure my knee again and had no other explanation. I have been taking Lescol for several months. I have experienced leg pain and weakness which has worsened as my treatment with this drug continued. I have had problems with my right knee for years but not with my left knee. Both knees hurt worse now with my left one being worse than the right. I have trouble getting in and out of my car and trouble getting up out of a chair due to pain and weakness. I have had worsening intestinal problems (a slowing of the digestion process). I thought the pain and weakness in my legs was due to arthritis but went to the doctor with the intestinal problems. He took me off of Lescol three weeks ago. The intestinal problems have cleared up but the pain and weakness have not!! Advicor (Extended-Release Niacin/Lovastatin) was approved by the FDA as a cholesterol-lowering prescription drug in December 2001. Advicor is a combination product containing both extended-release niacin and lovastatin (Mevacor). This drug has been approved for the treatment of primary hypercholesterolemia and combined or mixed dyslipidemia (raised cholesterol levels are associated with raised levels of triglycerides). It is indicated for patients who were previously treated with either component of Advicor, but who require additional lipid modification for LDL or HDL cholesterol and triglycerides. Advicor is a registered trademark of Kos Pharmaceuticals, Inc.
An article in the June 26 2004 issue of The Lancet, raises issue with the FDA for approving one of the newest statin drugs, Crestor, despite pre-approval evidence that the drug caused rhabdomyolysis. According to the author, Dr. Sidney Wolfe, director of Public Citizen’s Health Research Group, Crestor was approved despite an FDA claim that new cholesterol drugs would only be approved only if they presented a comparable or lower risk of rhabdomyolysis than drugs already on the market. According to Wolfe, patients taking Crestor experienced severe muscle deterioration at higher rates than patients taking other cholesterol-lowering drugs. In fact, the rate of post-marketing reports of rhabdomyolysis for Crestor appears to exceed that of all other currently marketed statins. In their enthusiasm to reduce premature deaths from heart attack and strokes the authors of the current Cholesterol Education Program (NCEP) guidelines are recommending that millions of Americans be put on statin drugs while ignoring warning signs of potentially serious side effects from the long-term use of these compounds. Would informed health consumers willingly choose to lower their risk of cardiovascular disease if it meant substantially increasing their chances for developing cancer or ALS after a decade or two? Dr. Ornish also questioned why the NCEP expert panel failed to recommend other options, such as diet and lifestyle changes that, for most people, “can be a safe and effective alternative to a lifetime of cholesterol-lowering drugs?” (Lower Cholesterol Without Drugs. The Washington Post. Sunday, August 8, 2004; Page B07). Fibrates are primarily effective in lowering triglycerides; they can lower triglyceride levels by 20 to 50 percent. There many fibrates available on the market today in tablet or capsule form. The most widely used brand name in the United States is Lopid (Gemfibrozil). In Canada, it is also known as Apo-Gemfibrozil, Gen-Fibro, Novo-Gemfibrozil, and Nu-Gemfibrozil. Gemfibrizol is available only with doctor's prescription in capsule or tablet form. mixed or combined hyperlipidemia - in such cases, raised cholesterol levels are associated with raised levels of triglycerides. raised triglycerides alone (often associated with low levels of HDL cholesterol) who are at risk of pancreatitis and disturbances of blood clotting mechanisms. The drug acts by several mechanisms, the principal effect being to reduce VLDL (very low density lipoproteins) in the blood. These structures are composed predominantly of triglycerides. Treatment with fibrates tends to increase HDL-"good" cholesterol levels by 10-15 percent. It may also lower cholesterol by up to 25 percent using the more modern fibrates. However, fibrates are not very effective for lowering LDL-"bad" cholesterol. muscle aches or liver disturbances. PLEASE NOTE: Some people with hyperlipidemia may be treated with a fibrate and a statin. In such cases, the risk of muscle and liver damage is increased. Fibrates are usually recommended for the management of hyperlipidemia in diabetes, where the nature of the lipid abnormality is more often of a raised triglyceride and low HDL-"good" cholesterol. This popular antihyperlipidemic, non-statin prescription drug is used to lower both cholesterol and triglyceride blood levels. patients with coronary heart disease, 'normal' LDL cholesterol and HDL cholesterol< 40 (HDL Intervention Trial, NEJM 1999; 341:410-418). However, results of a large study using Lopid seem to show that it may cause a higher rate of some cancers in humans. gallstones and problems from gallbladder surgery (although it may also decrease the risk of heart attacks). unusual tiredness or weakness (rare). increase the effect of the anticoagulants (blood thinners). make gallbaldder disease or gallstones conditions worse. Lopid is also less effective if you are greatly overweight. In most cases, it does NOT reduce the LDL ("bad") cholesterol levels. Lopid has not been studied in pregnant women. However, studies in animals have shown that high doses of Lopid may increase the number of fetal deaths, decrease birth weight, or cause some skeletal defects. at risk of pancreatitis, an inflammation of the pancreas, resulting in severe abdominal pain, nausea and vomiting. muscle pain, tenderness or weakness. TriCor® is a registered trademark of Abott Laboratories and Groupe Fournier. The drug is sold in over 77 countries world-wide under the primary brand names Lipanthyl® and Lipidil®. A drug taken for decades by millions of people with type 2 diabetes to prevent heart attacks, strokes and deaths offered no benefit in a broad group of patients, a study released Sunday [March 15th, 2010] shows. Fenofibrate, sold as Tricor, lowers triglycerides and boosts good cholesterol, seemingly lowering heart risk. But in most type 2 diabetes patients, it failed to achieve the goal of reducing a combination of heart attacks, strokes and deaths, says lead investigator Henry Ginsberg of Columbia University. The study, called ACCORD, involved 5,518 patients. It found that treating diabetic patients with Tricor and cholesterol-lowering simvastatin offered no greater benefit than the statin alone. The fenofibrate group had 291 heart attacks or strokes, vs. 310 in the statin group. "The drug is way overused," says Douglas Weaver of Henry Ford Health System in Detroit. "It's used to reduce cardiovascular events in people with diabetes, and the endpoint of this trial suggests that there's no evidence that it does that." Tricor was approved in 1974 [to lower cholesterol]. The Food and Drug Administration last year approved a new formulation, called Trilipix. Together the drugs earned $1.3 billion globally, reports their maker, Abbott Laboratories. The study, released here at the American College of Cardiology's annual meeting, provoked a sharp response from Abbott vice president Eugene Sun, who said in a statement that most study patients did not qualify for fenofibrate treatment because they did not have abnormally high triglycerides or low levels of good cholesterol. In such patients, he noted, pairing fenofibrate and simvastatin reduced heart attacks, strokes and deaths by 31% over simvastatin alone. But Steven Nissen, chief of cardiology at the Cleveland Clinic, called the analysis "unreliable," saying the subgroup was too small to generate trustworthy results. In a second, related study, doctors examined the benefits of intensive blood pressure lowering in diabetic patients and found that it failed to reduce deaths, heart attacks and strokes taken together, though it did reduce strokes in a separate analysis. But there are risks, Nissen says. "More intensively treated patients had a higher incidence of kidney failure and other serious side effects." The research is published online in The New England Journal of Medicine. (c) Copyright 2010 USA TODAY, a division of Gannett Co. Inc.
Derivatives of nicotinic acid, commonly called niacin (vitamin B3), work in the liver to lower levels of both cholesterol and triglycerides. Some strengths of niacin are available only with doctor's prescription. Others are available without a prescription, since niacin is also a vitamin. Niaspan is one of only two products in the United States approved for increasing HDL-"good" cholesterol levels in patients with dyslipidemia. At doses of 1,000 to 2,000 mg per day, it can increase HDL levels by 14 to 32 percent. Unfortunately, the most common side effect of Niaspan is the flushing sensation, which typically occurs on the face, neck, chest, and back, and is characterized by redness, tingling, or itching. Fortunately, in most cases, flushing lasts for one hour, approximately two to four hours after taking the dose. To minimize flushing, you should avoid alcohol, hot drinks, and spicy foods. Niaspan may cause decreased glucose tolerance, namely, an increase in blood sugar levels. If you have diabetes, you should carefully check your blood sugar levels and report any changes to your doctor. Omega-3-Acid Ethyl Esters developed in 1999 by the Norsk Hydro subsidiary Pronova – the first therapeutic drug ever developed in Norway - has been approved for the treatment of post-infarct patients in several European countries. It has been marketed across Europe and Asia under the brand name Omacor and in the United States under the brand name Lovaza. The active ingredients in Omacor are EPA/DHA ethyl esters, which have several beneficial effects on the cardio vascular system. hypertriglyceridemia (very high triglyceride levels, over 500 mg/dL, or 5.7 mmo/L). This drug is also meant to serve as an adjunctive therapy in addition to healthy eating habits, and the control of heart disease risk factors, such as high blood pressure, diabetes, and high cholesterol levels, and to be used in combination with other cholesterol-lowering medications. the inhibition of diacylglycerol O-acyltransferase, which is an enzyme that catalyzes the final step of triglyceride synthesis. Omacor is active on the plasma lipids by lowering triglyceride levels as a result of a fall in VLDL (very low density lipoprotein), and the substance is also active on hemeostasis and blood pressure. Omacor reduces the synthesis of triglycerides in the liver because EPA and DHA are poor substrates for the enzymes responsible for triglyceride synthesis and they inhibit esterification of other fatty acids. The increase in peroxisomes of ß-oxidation of fatty acids in the liver also contributes to the fall in triglycerides, by reducing the quantity of free fatty acids available for their synthesis. The inhibition of this synthesis lowers VLDL. A rise in HDL-“good” cholesterol is only small, significantly smaller than seen after administration of fibrates, and not consistent. The manufacturers of Omacor state that they use a highly modified purification process than differs from what can be obtained on the shelves at your local pharmacy. Omacor should be taken with meals. The typical dosage is 4 grams a day, which may be taken as one 1-gram capsule four times a day or two 1-gram capsules twice daily, especially if adequate response is not been obtained. patients with liver disease (they should consult their health care practitioner before using this drug). In the absence of efficacy and safety data, use of Omacor in children is not recommended. It also should be used with caution in patients allergic to fish. If both Omacor and a blood thinner are taken, health care provider should check occasionally to see if an effect has occurred. Because of the moderate increase in bleeding time (with the high dosage, i.e. 4 capsules), patients receiving anticoagulant therapy must be monitored and the dosage of anticoagulant adjusted if necessary. Regular monitoring of hepatic function (ASAT and ALAT) is required in patients with hepatic impairment (in particular with the high dosage, i.e. 4 capsules). PLEASE NOTE: Omacor is not indicated in exogenous hypertriglyceridemia (type 1 hyperchylomicronemia). There is only limited experience in secondary endogenous hypertriglyceridemia, especially uncontrolled diabetes. The long-term lipid-lowering effect of Omacor (after more than one year) is not known. William E. Feeman Jr. MD, a family practitioner, Bowling Green, Ohio, United States, conducted the long-term, observational Bowling Green Study, which has followed 2,818 family-medicine patients since 1974. The effort of this investigator-initiated and self-funded study was to determine what components of lipid profiles have the greatest impact on risk of atherosclerotic events. In his scientific poster, Dr. Freeman presented data on 1,339 men and 1,479 women ages less than 29 to greater than age 80 who were seen in his practice between 1974 and 2001.
triglycerides (150 mg/dL or higher). This group does require aggressive lipid therapy. abnormal HDL-"good" cholesterol (>39 mg/dL) and triglycerides (>150 mg/dL). All these people require lipid therapy as - according to Dr. Freeman - dyslipidemia, after smoking, is the next most important risk factor for atherosclerosis. In other words, these people can bring blood triglycerides down to normal by other than pharmacological means. Source: 17th World Conference of Family Doctors 2004, Orlando, Florida. If your triglycerides are high (over 200 mg/dL, or 2.3 mmol/L) your doctor will check first whether your HDL-"good" cholesterol is low (however, less than 35 mg/dL, or 0.04 mmol/L in men and 45 mg/dL, or 0.5 mmol/L in women are considered very low!). Research suggests that the combination of low HDL and high triglycerides indicates a generalized disorder of lipid (fat) metabolism, called metabolic syndrome X, which may place you at high cardiovascular risk. eating a diet low in carbohydrates and saturated fats. After 3 months, if despite the sincere lifestyle changes your triglycerides remain high and HDL-"good" cholesterol low, your doctor may consider adding a fibrate drug such as Lopid ® (gemfibrozil) to your regimen. However, according to a Canadian study, fenofibrates should be the drugs of choice to increase HDL and reduce triglycerides, especially the newly available microcoated fenofibrate with better pharmacokinetics (Canadian Cardiovascular Congress 2000 Vancouver, B.C. / October 29-November 1, 2000). From doctors' point of view, being on medication doesn’t mean you failed – just that you need a little more help that diet and exercise can provide. However, you would be astounded how many people would rather take a pill than consider changing anything else. You need to take your medication for initially 3 months and then check your triglycerides level under medical supervision. If you have a family history of lipid disorders your doctor may choose niacin. If that doesn’t work, he will probably add to your regimen a fibrate (e.g., gemfibrozil, fenofibrate) - especially, if you suffer from familial hypertriglyceridemia - or a statin (e.g., simvastatin, lovastatin). Without treatment you may eventually develop atherosclerosis leading to a heart attack. (Familial combined hyperlipidemia manifests as high cholesterol, high triglycerides, or both). If your triglycerides are greater than 500 mg/dL, or > 5.65 mmol/L your doctor may prescribe fibrate therapy, either alone or in combination with niacin, a statin, or fish oil (taken in supplement form or as 30 percent of dietary calories). If left untreated, triglycerides over 500 mg/dL can cause pancreatitis (the inflammation of pancreas). If your triglycerides are borderline-high (150 - 199 mg/dL, or 1.7–2.3 mmol/L) with normal LDL-"bad" cholesterol (less than 130 mg/dL, or 3.4 mmol/L) your doctor my consider using niacin or a fibrate. have other cardiovascular risk factors, such as smoking or a family history of heart disease. If you have high triglycerides (over 200 mg/dL, or 2.3 mmol/L) in combination with high LDL-"bad" cholesterol (over 160 mg/dL, or 4.1 mmol/L), the LDL abnormality will be treated first - along with lifestyle changes, medication (usually statins), or both. If, however, your triglycerides remain high despite statin therapy, your doctor may consider adding niacin to bring them into the normal range (less than 150 mg/dL, or below 1.7 mmol/L). High triglycerides may be caused by other disorders, such as type 2 diabetes, alcoholism, hypothyroidism, Cushing’s syndrome, liver disease, uremia, dysglobulinemia, or nephrotic syndrome.Once the underlying disorder is identified and treated, triglyceride levels often decrease. PLEASE NOTE: Because drinking can cause hypertriglyceridemia, you will be asked by your doctor about your drinking paterns, and suggested - if needed - to cut back or eliminate alcohol before exploring other treatment options. Lipid measurement may show normal total cholesterol, with a low HDL-“good” cholesterol and a moderately elevated triglyceride level; for example, total cholesterol of 197 mg/dL, an LDL-“bad” of 120 mg/dL, an HDL of 35 mg/dL, and a triglyceride of 210 mg/dL. That pattern is not unusual; in fact, it is seen in about 20 percent to 30 percent of people who have had a myocardial infarction (heart attack). However, an important issue is how to best manage these people. In those cases, doctors may now use a new commercially available test. This procedure uses nuclear magnetic resonance (NMR) spectroscopy to fractionate VLDL, LDL, and HDL concentrations into 15 different subfractions. It is completely automated and takes only about one minute to perform, since it measures all subfractions simultaneously. For example, two people may have similar lipid levels, but if NMR spectroscopy shows that one has a much higher proportion of small, dense lipoprotein particles, that might tip the balance toward treatment, especially if there is a family history of cardiovascular artery disease (CAD) or other risk factors. There are numerous health conditions related to therapy with statin drugs. The decrease in CoQ 10 blood levels caused by statin therapy diminishes the energy output of heart muscle cells leading to congestive heart failure. A mysterious rise in the incidence of heart failure has been noted in the U.S. in recent years which may well relate to the continually increasing use of statin drugs. Weakness of muscles when taking statin drugs probably relates to decreased muscle cell energy production caused by diminished levels of CoO Q 10. When severe this muscle weakness may progress to a state where muscle soreness and pain appears. In this state the muscle cells break up releasing muscle protein and enzymes into the blood. If the muscle damage is extensive kidney failure (myoglobulinuria) and severe acidosis due to lactic acid production may occur (often a fatal problem). Rise in fasting insulin values by 13 percent is seen after statin therapy is started. This is undesirable because high levels of insulin increase the construction of arteriosclerotic plaques over time. Also high insulin values accelerate the rate of development of both diabetes and aging. Antioxidant blood levels decrease Alpha Tocopherol and Beta Carotene levels in the blood fall by up to 22 percent in patients taking statin drugs. Decreasing one's anti-oxidant stores in the blood is obviously undesirable as this means that our ability to remove free radicals will be impaired. The cause for peripheral neuritis is often obscure. The incidence of peripheral neuritis is 15 times greater in persons taking statin drugs than in control subjects. This could also relate to deficiency of CoQ 10. This neurologic disorder causes patients to have a total loss of memory for several hours. During these episodes the person does not know who he or she is, does not know what they are doing and often has a complete loss of memory about their past history. Recently it has been discovered that many persons taking statin drugs have experienced TGA and that there are thousands of persons with memory dysfunction, extreme forgetfulness, incapacitating confusion and profound disorientation for every person who has an episode of TGA. The relationship of these memory problems to usage of statin drugs is nearly completely unknown in the medical community. Stopping the statin drug leads to recovery which may take several months. Abnormal results of liver function tests are common in persons taking statin drugs. Severe abnormalities are uncommon and the abnormal liver function disappears when statin therapy is stopped. Cholesterol-lowering drugs actually increase the amount of cholesterol secreted in bile. This in turn can increase the risk of gallstones. Stroke risk goes up when cholesterol values are lowered below 140 mg. Dr. Gilbert Gordon suggests keeping cholesterol values near 220 mg. to preserve the natural antioxidant benefits of cholesterol for the body (Dr. Garry Gordon Chelation Discussion Group Feb 11, 2004 How low for cholesterol?). A large population study of cholesterol levels in patients taking statin drugs revealed a decrease in deaths from heart disease but this occurred at the expense of an equivalent increase in deaths from suicide and cancer. Lowering cholesterol decreases the number of receptors for serotonin on brain cell membranes. Serotonin acts to suppress aggressive behavior so lowered serotonin levels could lead to increased violence and suicide. Possibly of greater importance several early studies of the results of statin therapy suggested that there might be an increased risk of developing cancers and lymphomas in persons taking statin drugs. These studies were ignored and aggressive marketing of statins began. Such adverse results could easily take more than 10 years of statin usage to become manifest and the rapidly increasing rates of cancer might tend to obscure cancers being caused by statin therapy. Certainly some of this increase in cancer incidence could be due to the rapidly increasing statin drug usage. Knowing that CoQ 10 is a fine therapy for cancer suggests that lowering the levels of CoQ 10 with statin drugs might increase the risk of cancer. inhibits synthesis of VLDL carrier lipoprotein B. There is no question that it does some very good things. increase the liver enzyme production. Our liver is our major detoxifying organ. People that live long are good detoxifiers while people that die early are poor ones. This is directly related to our genetic ability to detoxify through standard liver enzyme pathways. Unfortunately, Lopid, in its regular and ordinary pharmacologic course, causes an overproduction of liver enzymes. (There are 50 to 100 delicate liver enzyme systems involved in the cytochrome P450 liver phase I and phase II glutathione-S-Transferase). As Ronald B. Keys, JD, PhD put it, by choosing liver-toxic Lopid, you overtax and burden these systems compromising the long-range liver capacity and function – and, consequently, shorten your life. It is not just whether the liver enzymes are elevated from the toxic aspects of Lopid, but whether its long-term use is destroying the functional reserve of the liver at the same time. In other words, you could have normal liver enzymes - yet have impaired hepatic function reserve from the long-term use of this toxic medication. Lopid then is an ideal medication for those who want to live in physician’s office everyday instead of going to work and/or managing family. Like numerous other toxic drugs, it creates a co-dependency relationship on your doctor. Although less well studied than statins, fibrates have demonstrated similar cardiovascular benefits especially in people with high triglycerides and low HDL-"good" cholesterol values. However, there are not any large-scale, randomized, controlled trials comparing both drugs alone or in combination. When undergoing a combination therapy, these patients should be monitored closely (Parkhurst Exchange # 34:2003-04). In fairness, compared to many drugs, most of the statin drugs are some of the safer drugs you might take and actually have the beneficial effects of being powerful antioxidant and anti-inflammatory agents. These beneficial features are likely the reason studies show decreased cardiac deaths when they are used. Nevertheless, the statin drugs' potential side effects are significant. In some they deplete coenzyme Q 10 within the liver enough to cause liver enzyme elevations and within the muscles to cause myopathy (see below). Also, in many physicians' experiences, statins cause depression or loss of motivation in the majority of patients, probably due to alteration of cholesterol metabolism in the brain. As a result, many of these patients are also on SSRI (selective serotonin reuptake inhibitor) drugs, such as Zoloft, Paxil, or Prosac. A doctor prescribing statin and not first using a good multi vitamin, and without tracking your homocysteine and Lp(a), and without giving replacement CoQ10 is practicing incomplete medicine. A study in the Archives of Neurology published unsettling new information: "Atorvastatin decreases the Coenzyme Q10 level in the blood of patients at risk for cardiovascular disease and stroke" (Arch Neurol, Jun 2004; 61: 889 - 89). Atorvastatin is the chemical name for Lipitor ®, the world’s best selling cholesterol-lowering prescription drug. This new study, however, is simply confirmation of what scientists have known for some time: “miracle” but potentially harmful statin drugs may lower levels of Coenzyme Q10 (CoQ10) - a superior antioxidant, essential for the production of energy in every cell of the body. Isn’t it a little ironic? Millions of heart patients are taking a drug that depletes CoQ10 which - through many years of research - has been shown to be effective in protecting the cardiovascular system and helping to prevent heart disease. Meanwhile, the United Kingdom has decided to reclassify Zocor (another best selling statin drug) as over-the-counter (OTC), in spite of the fact that Zocor may cause muscle pain or weakness, as well as liver problems (according to the Zocor website). Statins are not cholesterol- but "mevalonate"-lowering "therapy". This mother molecule (mevalonate) also makes CoQ10 and other vital "stuff" like farnesyl, isoprenyl, isopentenyl, geranyl, dolichol and squalene. Similarly, aspirin is not simply "anti-clot therapy", it rearranges all fat-based "house keeping", pain and signal machinery. Statins and aspirin hamper (inhibit) fundamental body processes. Whatever good necessarily comes with the bad. PLEASE NOTE: If you are on statins, taking 100 mg - 200 mg of CoQ10 daily will help you replenish depleted CoQ10 stores as you work with your doctor in weaning yourself off these drugs. Coenzyme Q10 is one of the most valuable investments you can make for your heart - and one of the most important nutrients you can take for your health. In fact, if you can only take one or two supplements a day - CoQ10 should absolutely be one of them! “The purpose of the Heart Protection Study was to explore whether lowering cholesterol provides benefits to a wide range of people at high risk for coronary events. It was the largest clinical trial of its kind, conducted over 5 years with more than 20,000 patients with heart disease, diabetes, and noncoronary vascular disease. The Study was the largest of its kind, researching groups who had not previously been extensively studied. It was the largest study of women. The largest study of people older than age 70. The largest of people with diabetes. And even the largest of people with heart disease and normal cholesterol. Unfortunately, the above medical study is an example of unethical reporting. Both its sponsor (Merck) and their authors - Oxford's Drs. R. Collins, Armitage and Sir A. Peto - did not publish the negative findings hiding the truth about the study patient group mortality curves (in this case, women). Might Money Spent on Statins Be Better Spent? As a general practitioner I wonder how many million pounds sterling the NHS could save if the Medical Research Council, the British Heart Foundation, and the Lancet shared this view. An example is in the prescribing of statins. They are a major cost in my practice, as I am sure they are to many practitioners. Even in general practice I recognised the Scandinavian simvastatin survival study as a seminal paper on the benefits of statins, and as we used to be taught to evaluate evidence (as opposed to stick to protocols) I read it. I was surprised to learn that more women died in the treated group than in the control group. On discussion with cardiology colleagues I was assured that as the numbers were small it was a statistical anomaly, resolvable by larger studies. Imagine my delight when I heard of the large heart protection study showing clear benefits in the use of statins for women. On reading this study I was therefore disappointed to find the total mortality data for women missing. I now understand that the total mortality benefit for women did not reach significance and therefore was not published (Louise Bowman, personal communication, 2002). I do not understand why the censors of this paper do not realise two things. Firstly, any meta analyses based on this study are likely to be skewed. Secondly, in such long term studies total mortality, not improvement in the condition, should be the gold standard for evaluation (euthanasia, for example, provides 100% cure of headache but should be ruled out on the mortality data). I have yet to find a paper showing a significant reduction in mortality in women for groups treated with statins. It therefore seems that any benefit, if found, will be minimal. Yet we are almost compelled by protocols such as the national service framework for coronary heart disease and local prescribing incentives to prescribe for this subgroup. Also the supporting documentation to the new general medical services contract indicates that such statin prescribing may become a quality indicator. I wonder whether the money could be better spent or if we should abandon the little evidence based medicine we currently have? Thanks! I have been trying to reduce my triglycerides for several years now. I was placed on (...) Tricor which produced side effects so badly that I could not take it. I started taking your Triglycerides Reduction Formula and following the Diet just under two months ago. My doctor just called and gave me my lab results. My triglycerides fell from 432 to 170, my HDL went from 30 to 48 and all the other results were normal which hasn't happened in years. Needless to say, I just ordered another 2 months' supply of your Triglycerides Reduction Formula. * The testimonial above has been presented as a true story. However, it has not been reviewed by Full of Health and is the opinion of the listed individual. Physicians that have only been trained in pharmaceutical medicine keep prescribing toxic medications and neglect, fail, and often refuse to consider non-pharmaceutical methods to lower blood lipids through other, non-pharmaceutical means. Therefore, starting with lipid-lowering medications puts you - as Ronald B. Keys, JD, PhD put it - on the drug-treatment-merry-go-round nightmare. In fairness, many physicians, legally, may be under a gag rule and be unable to tell you about non-pharmaceutical options and alternative treatments to lower triglycerides because of "managed care requirements" such as Health Maintenance Organization (HMO) - a health plan involved in delivery of health care. These requirements have made the whole managed care set up controversial and destructive of the time-honored physician-patient relationship, detrimental to the short-term and long-term interests of the patient. Oftentimes, it is the system rather than the physician that is the problem. biobehavioral modification, interconnected with the psychosocial, behavioral, and biological processes. These non-drugs methods, however, usually require the person to be intimately involved with his or her own treatment and life. Unfortunately, most people choose to take their body to the doctor and say, "Here's my broken body. You fix it. Give me a magic pill." This is ideal - but only for those who wish to have - besides a likely shorter life span - a co-dependency relationship and live in their physician’s office everyday. "I tested high for triglicerides. On the test results that the doctor sent me for review, he wrote "may need meds." Medical orthodoxy is: poke, prod, and test, then cut open or inject drugs. Consumers buy into this because they like to have pills to fix what's wrong with them. They don't like the idea that they've been abusing their body and they really should stop. Sure enough, a Google search yields: "Nutritional Triglyceride Reduction." Before I buy any "meds," I'm going to ask the doctor if he's considered nutritional alternatives. Hmm... perhaps they're not all bad..."
Compared to the standard medical treatment, the nutritional supplementation for high blood triglycerides and other lipids is clearly a superior option. It stands to reason that any safe approach to elevated blood triglycerides, no matter how low the probable success rate, should be vigorously investigated. Thousands of people worldwide would benefit from it. Anecdotal and empirical experience regarding the nutritional approach to blood lipids has existed for almost 20 years. While reasonable people do not expect 100 per cent success for any therapy, hundreds of them can say that they have experienced a remarkable improvement with this approach. Isn't that why we have science, to investigate methods such as nutritional control of high triglycerides? It is beyond comprehension that scientific medical studies neither refute nor support the nutritional approach. There are no established medical research processes or procedures to evaluate "non-drug" remedies, and for a reason. There is still little medical evidence that vital substances (nutrients) required for life in small amounts can have great healing effects in larger amounts. To understand why the nutritional approach to blood fats has not been investigated, you need to realize that there is no special interest or economic incentive to provide proof, only a large counter-incentive not to do so by those with the means to run such a study. In other words, the only incentive is a general, rather than a special interest. So, if governments won't conduct a study on behalf of their people to verify inexpensive methods already available, who will, especially if it would cost a company millions? And why bother? Should nutritional triglyceride reduction not work, it has been shown to be harmless. Furthermore, a large study isn't going to do the average person much good. The only way to find out whether nutritional triglyceride reduction can work for you is for you to try it. Then you can find out what others learned years ago: Triglyceride Reduction Formula can control the level of blood fats, such as triglycerides, and reduce risk for heart attack or stroke safely. Unfortunately, no effort what-so-ever has been made by the medical scientific establishment to investigate, much less verify, this approach. Therefore, up to date, there haven't been the outcome studies to document that the nutritional triglyceride reduction does not work. They don't exist because the regulators and others are opposed to doing the research - because so many people have discovered that nutritional triglyceride reduction does work! It's time then for true studies to be done on outcomes of the patient. The medical gold standard of research - the double blind, placebo controlled, crossover study - was great -- but only for infectious diseases. As it is impossible to hold all variables the same, this standard has become outmoded for today's outcome studies; it should go the way of the monetary gold standard. Elevated plasma triglycerides are in your control and can be brought down naturally. As high blood triglycerides are a common lipid disorder in North America, we all know someone with this problem or we have it ourselves. If you're interested in avoiding or ending personal experience with this disorder, we have good news for you. carbohydrates, especially refined sugar, processed grains and starches. undergo the ongoing process of detoxification - an essential factor in preventing and fighting all health problems. Without improving the lipid metabolism, prescription drugs are... a futile exercise, although they can be life saving at times. This is especially important for those, who have a family history of diabetes, heart disease or stroke due to atherosclerosis. Fortunately, there are people, including a growing number of doctors, who admit that there are successful methods to reduce elevated levels of blood lipids (fats), other than temporary medical intervention. There are also people - with or without high triglycerides - who are willing to trade their lifestyle habits for healthy arteries and a healthy old age; people who are making serious efforts to give their heart and cardiovascular system a longer, healthier life through optimum nutrition. The cornerstone of our triglyceride control method is our proprietary Triglyceride Reduction TGs Formula. It is a comprehensive multiple vitamin and mineral supplement that provides optimal levels of nutrients to support people with high blood triglycerides. There have been medical studies on the beneficial effect of nutritional supplementation on triglyceride levels; it appears people with high triglycerides do benefit from dietary supplements. providing optimum conditions for the proper functioning of the body's own intrinsic ability to heal itself. As far as the cardiovascular system is concerned, according to orthomolecular nutrition, if the right building blocks (nutrients) are present in the body - in the right amounts and at the right time - the body will do the rest. prevent weight gain by improving transportation of the body's leptin into the brain (this hormone, secreted by fat cells, is reponsible for regulating appetite and energy expenditure, and for controlling weight). So far, we have introduced our proprietary Triglyceride Reduction TGs Formula to our clients and customers in 44 countries: the United States (including Virgin Islands, Hawaii, and Guam), Malaysia, Australia, the United Kingdom, South Africa, Thailand, New Zealand, Germany, Belgium, Trinidad, Mexico, Italy, Spain, Pakistan, Singapore, Mauritius, Suriname (South America), France (including Martinique), Bolivia, Russia, Croatia, Poland, Portugal, Denmark, United Arab Emirates, Brunei Darussalam, Hong Kong, Macau, St. Lucia (West Indies), Norway, Saudi Arabia, Philippines, Brasil, Yemen, Kingdom of Bahrain, Turkey, China, Guatemala, Kuwait, Japan, Taiwan, Jordan, Cyprus and Fiji Islands. This all-natural combination of 65 nutrients and phytonutrients (plant nutrients) not only keeps your blood fats in check (as drugs do), but actually helps your body rebuild the organs and systems that control your blood lipids - without side effects. No wonder, Triglyceride Reduction TGs Formula can produce results that doctors have rarely seen before, even with hard-core prescription drugs. And, unlike pharmaceutical drugs, it is very body-friendly. Triglyceride Reduction TGs Formula does not "destroy" triglycerides! It helps the body to eliminate the cause, namely, to correct the possible metabolic imbalances that are known to contribute to high blood triglycerides. Our Triglyceride Reduction TGs Formula is a complete "multi" supporting healthy blood lipid levels. It has been designed to provide optimal concentrations of vitamins, anti-oxidants, lipotropic factors, chelated minerals, trace minerals, and digestive enzymes as they are all necessary to bring the triglycerides down to normal. improperly oxidized (metabolized) fatty acids in the gut by pancreatic enzymes. Therefore, only a multi-based, full-spectrum nutritional supplement can help - in most cases - solve the problem. fatty acid congestion in the liver. Again, a full-spectrum nutritional supplement providing B vitamins, lipotropic factors, hydrochloric acid (HCL) and digestive enzymes can help - in most cases - solve the problem. Glandular Substances (Adrenal, Pancreas, Hypothalamus, Liver, Pituitary/Anterior), Garlic Extract (Allium sativum) (Bulb), Guggulipid Extract (Commiphora mukul) (Std. to 2.5% Guggulsterones), Betaine (Trimethylglycine), Arjuna (Terminalia arjuna) (Std. to 0.5% Arjunolic Acid) (Bark), Pantethine (as Coenzyme A precursor), Sytrinol® ** (Nobiletin and Tangeritin Compound), Quercetin, Bitter Melon Leaf Extract (Momordica charantia) (Std. to 0.5% Charantin), Pancreatin 8x, Propolis (2:1), Golden Root Powder (Rhodiola Rosea) (Std. to 3% Rosarin), Maca Extract Lepidium peruvianum Chacon) (Std. 4:1) (Root), Ox Bile, Cayenne (Capsicum annum) (Std. to 0.3% Capsaicin) (Fruit), Cinnulin PF® ***Cinnamon Extract (Cortex cinnamoni) (Bark), Gymnema Sylvestre (Std. to 25% Gymnemic Acids), L. Banaba Leaf Extract (Lagerstroemia speciosa) (Std. to 1.0% Corosolic Acid), Silymarin Extract Std. (from Milk Thistle) (Seed), Artichoke Leaf Extract (Cynara scolymus) (Std. to 5% Cynarin), Berberine (Barberry Root Extract 4:1) (Berberis aristata), Blueberry Leaf (Vaccinium angustifolium), Burdock Powder (Arctium lappa) (Root), Chlorophyll (as Sodium Copper Chlorophyllin), Curcumin Extract (Curcuma longa) (Root), Gentian Powder (Gentiana lutea) (Root), Grape Seed Extract (Vitis vinifera) (Std. to 95% Oligometric Proanthocyanidins), Rosemary Leaf Extract (Rosmarinus officinalis) (Std. to 6.0% Carnosic Acid), Shilajit (Himalayan mineral pitch), Triphala Extract (Terminalia belerica, Terminalia chebula, Emblica officinalis) (Fruit), Bromelain, Papain, Alpha Lipoic Acid, BioPerine® **** Black Pepper Extract (Piper nigrum) (Fruit), Trans-Resveratrol (from Japanese Giant Knotweed Root), Vanadium (Vanadyl Sulfate). * Daily Value not established. DIRECTIONS: Take 2 tablets 2 times daily with substantial meals, or as recommended by a qualified healthcare professional. † This statement has not been evaluated by the FDA. This product is not intended to diagnose, treat, cure or prevent any disease. Other ingredients: Microcrystalline cellulose, vegetable stearate and silica. ** Sytrinol® is a proprietary extract of Plymethoxylated flavones and tocotrienols from citrus and palm fruits. *** Cinnulin PF® is a registered trademark of Integrity Nutraceuticals International. As you can see, there is no one "miracle" ingredient in Triglyceride Reduction TGs Formula. It is a specialty complex orthomolecular formulation with strong lipid-lowering properties providing a comprehensive support for the entire circulatory system. All nutrients are present in specific ratios and amounts in order to correct longer standing deficiencies and imbalances that are known to contribute to elevated blood fat levels. They come in pill form, but they are not drugs; they are components of food. For better absorption and consistent blood levels, the doses should be spread out over each day. Hundreds of thousands of people have proven the efficacy of this approach. 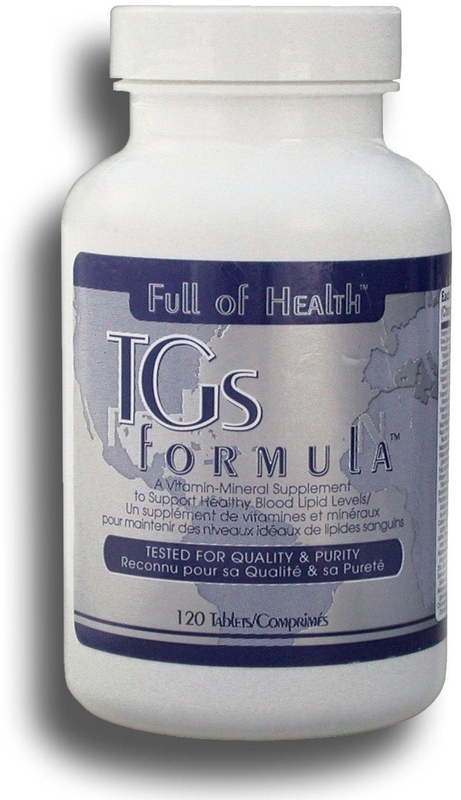 There has not been a single reported harm done by taking our Triglyceride Reduction TGs Formula. We recommend nutritional measures aimed at controlling elevated blood triglycerides. And we do so on the basis of evidence gained from observations in hundreds of users of our Triglyceride Reduction Formula supported by basic dietary and lifestyle modifications. But not everybody agrees that this kind of evidence is enough to act upon. Until formal proof is established, this matter remains a legitimate question of judgment, which varies from one person to another. see if that half has lower triglyceride levels than the rest. Such critical test should be performed in a three-to-five-year, $75-million study conducted, for example, by the American Heart Association. The conclusive evidence would be published as a formal proof of the role played by optimum nutrition in the process of controlling blood triglycerides. Unfortunately, such a multi-million study has not been run yet. Should we wait then for "conclusive" evidence, which may be years away and - too late for some of us? Can we accept probable evidence? We need to realize that not taking a stand, insisting on waiting until all the evidence is in, is itself - a position and a recommendation! Not taking a stand is not really the neutral position it is made out to be. On the other hand, physicians like to pretend, and many have kidded themselves into believing, that whatever they espouse has been "scientifically proved." A great deal of what established medicine recommends today with good conscience is not formally "proved"! In other words, in medicine it is not uncommon to recommend measures for which only substantial evidence exists. Many doctors have for years been recommending the lowering of blood cholesterol because this would probably help prevent coronary heart disease, but this was not "proved" until 1984, and then for only a selected category of patient. And only in early 1985 did a panel of 13 experts convened as part of a National Institutes of Health "consensus conference" conclude "beyond a reasonable doubt" that lowering elevated blood cholesterol levels would reduce the risk of heart attacks. In fact, "beyond a reasonable doubt" means "with a high order of probability." Surely this is not formal proof. It's a consensus decision. The formal proof on the health benefits of exercise is not yet in, yet practically all physicians recommend it. And they are right to do so, because the probable evidence is excellent. The key question for much good nutritional advice is not whether proof is at hand, but what is the order of probability that the advice is correct. Existing evidence indicates, with a very high order of probability, that elevated levels of triglycerides in the blood can be reduced by the nutritional measures - without multiple prescription drugs. Prolonged stress is one of the main causes of elevated blood triglycerides. A new study has found the evidence that psychological, mental stress causes triglycerides to stay in the bloodstream longer contributing to cardiovascular health problems (Psychophysiology, 2002: 39; 80-85). The stress factor, however, has been repeatedly underestimated with regards to elevated blood lipids (fats) both by doctors and their patients. I have high triglycerides and all the doctors told me was to lose weight or change my diet, not giving me a bit of information like you have on your website. Doctors aren't doctors anymore, they don't explain or even give us pamphlets. That is very irritating. It's my life they are playing with! © 2001-2010 Reduce Triglycerides.com: Lowering High Triglycerides Naturally with Triglyceride Reduction TGs Formula: A Drug-Free Approach to Elevated Blood Triglycerides. All rights reserved worldwide. This document may not be copied in part or full without express written permission from the publisher. The information on lowering high triglycerides provided herein is a general overview on this topic and may not apply to everyone, therefore, it should not be used for diagnosis or treatment of any medical condition. While reasonable effort has been made to ensure the accuracy of the information on reducing elevated triglycerides Naturally, Full of Health, Inc. assumes no responsibility for errors or omissions, or for damages resulting from use of the high triglyceride information herein.